The Results Are In: My French Ain’t Half Bad! Turns out my French is better than I give myself credit for, at least according to the Alliance Française and the test I took there! 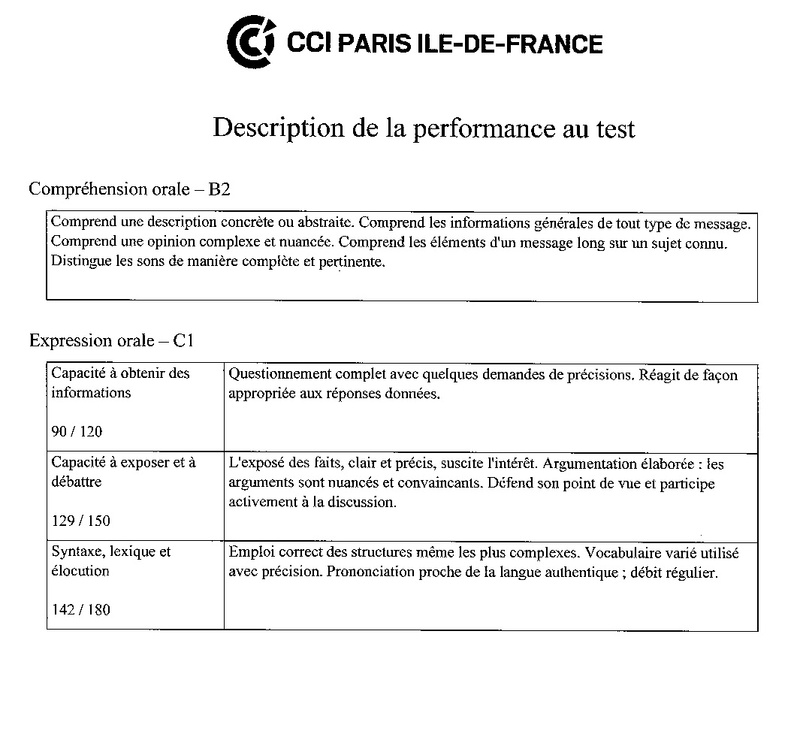 The exam was two sections: the first on computer, which started with very basic French and quickly progressed to complicated phrases and vocabulary. In one of the sections I had to answer questions on women’s hairstyles depicted in basic drawings. I wouldn’t know what those styles were called in English, so I’m pretty sure I bombed the French part! Points were awarded for correct answers and removed for incorrect answers. Intimidating. For the second section of the test, I spoke with two native speakers. In our first conversation, I had to pretend to be interested in buying a home in the southwest of France. Not so hard to pretend I wanted that house! In the second conversation, I had to convince one of them to give up using her cell phone for 24 hours. ·Can understand the main ideas of complex text on both concrete and abstract topics, including technical discussions in his/her field of specialisation. ·Can interact with a degree of fluency and spontaneity that makes regular interaction with native speakers quite possible without strain for either party. ·Can understand a wide range of demanding, longer texts, and recognise implicit meaning. ·Can express ideas fluently and spontaneously without much obvious searching for expressions. ·Can use language flexibly and effectively for social, academic and professional purposes. ·Can produce clear, well-structured, detailed text on complex subjects, showing controlled use of organisational patterns, connectors and cohesive devices. These results were just the encouragement I needed, as I’ve been doubting whether French is something I can ever hope to master. This reenergized me, and made me start dreaming again of spending a summer, or two, or three, in France, going to language classes, and of one day being so fluent that maybe I even fool a French person or two. This entry was posted in Bilingual, France, French and tagged Alliance Francaise, Bilingual, French Language, French People, Language Proficiency, Languages, Learning a language, Learning French by A French American Life. Bookmark the permalink. Congratulations on your results. I’m a Brit living in Québec and married to a Québécoise, with two kids, so I have an idea of what you,re going through. Keep up the good work and the very interesting blog. Thank you! Are you learning French, too, or already speaking it? I’ve been here for eight years now, so my French is not too bad. “Je me débrouille pas mal.” I get by pretty well. In Québec, I find that if you make the effort to speak French, les Québecois et les Québécoises are very happy to help you out if you ask “Comment dire (Insert English Word) en français?”. Many times, they want to practice their English with me, so I speak French and they speak English, which is a little weird, but fun. Nice! I hear the Québécoises are quite accomodating and kind to those who attempt French! I love those Franglais conversations Like you said – weird but fun! İ have been dabbling in French for a year on and off with the hope that one day İ will settle there. As İ can only stay for 3months each time, my French stays at the level. 😦 İ get frustrated when people don’t understand my pronunciation of ‘lait cru’ because İt is the word İ use the most often! I think that unless you can stay in France, or be around French speakers, it’s hard to progress. If there’s an Alliance Française where you live, they usually offer classes and conversation groups. Private lessons helped me a lot, too. Plus reading French books, articles. Anything you can find! Well done! I’m starting a French degree this September, so I hope I can reach your level. Especially since my (French) boyfriend and I are considering settling in France. Thank you! And best of luck to you. It’s a tough but very rewarding road. If you end up in France, it will be so much easier to learn the language! What Decallieres said of the Québecois is true of the Provençales, too. Initially I only had one French friend who made a point of practising her English with me. Now they’re all doing it – they see how hard I’ve been trying with the French I suppose. Oh God, maybe they all think I’m hopeless and they’ve decided to speak English with me to make me stop with the awful French. Eek. It seems like everyone tolerates broken French better than the Parisians! Either that, or they’re all secretly ridiculing us behind our backs about how hopeless we are. Great post! I’ve always wanted to test my Spanish as well I’ve just never gotten around to it. These are great thoughts on what it’s like to live as a bilingual. Maybe I’ll post something similar on http://livingbilingual.com. Stay tuned I’d be curious to get your thoughts. WIll do! Thanks for reading.